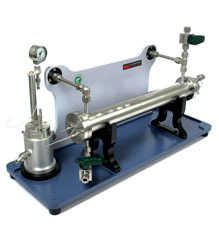 Our Salamander tubular reactor offers a cost effective way to enter the flow chemistry field on a lab scale. Our Salamander range of tubular reactors may be jacketed to used with a heat transfer fluid or electrically heated for higher temperature applications. Our Salamander jacketed reactor with capillary tubing has a total reactor volume of 6 -18 mL and can operate at pressures of up to 200 bar. Our range of Salamander electric plug flow reactors are for gas-solid and gas-liquid-solid applications. There is wide range of variability in the scope of these reactors. We manufacture reactors supporting a few milligrams to hundreds of grams of catalyst. We produce a budget range at one end of the scale but also offer a multiple set of reactors for high throughput experimentation. We have supplied 128 gas-liquid-solid reactors all operating at the same time, with a common feed, temperatures of up to 600 C and pressures of up to 30 bar. We also manufacture a range of reactors that support static mixers in Stainless Steel and C276 materials. These range in reactor volumes from 20 mL to 1L. We offer a wide range of static mixers; depending on the user application, tube diameter and mixer performance. Introduction of reactive gases to our Salamander flow reactor can be effectively achieved using our Gastropod Gas Liquid Module.